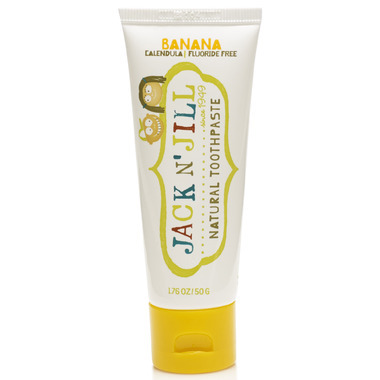 This natural toothpaste has organic calendula to soothe gums, is rich in Xylitol, and has an organic natural banana flavour. It is also safe to swallow! Ingredients: Xylitol, Purified Water, Vegetable Glycerin (Coconut derived), Silica, Certified Organic Banana Flavour (Musa Paradisiaca), Xanthan Gum, Certified Organic Calendula Officinalis Extract, Potassium Sorbate (Naturally derived), Citric Acid. Great for toddler who likes to swallow toothpaste! We like the variety of flavours, and the all natural ingredients. Have been buying this toothpaste for years now. Our kids love that toothpaste, but they prefer the raspberry one. By the way, this product has been recommended by our dentist as a good alternative to fluoride toothpastes. Banana!! This was a big hit with my 3 year old. Cute packaging and he likes the taste. Yummy! I'm happy with the texture, and it doesn't take much to clean a little mouth. Very happy with this product. Can't wait to try their other flavors! Favourite brand, all the flavours are great! "It's doesn't taste anything like banana, and being clear makes it look disgusting!" - straight from DD. Great product! My baby daughter refused to let me brush her teeth until we started using this toothpaste. Now she opens her mouth when it's time to brush her teeth! We tried it as well and it tastes great. My kids have been using this for over a month and seem to love it. I like it that it's got safe ingredients.